Need a fun and healthy school lunch idea? One that will help you get an extra serving of veggies in? If so, you are going to love these 7 Layer Greek Cups! Welcome back for another fun school lunch idea. One that together with a couple of hard-boiled eggs and some fresh berries or grapes, will sure satisfy kids and adults alike! Let’s face it, when it comes to school lunches and office lunches, adding a little variety can be a bit tough. I know that, for me, figuring out how to actually pack the food to be eaten 5 hours later was something I needed a little bit of help with. 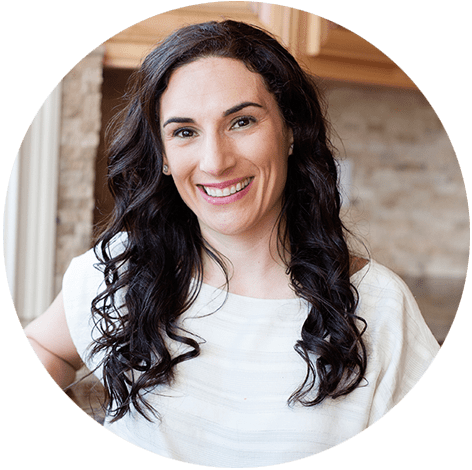 For this very reason, all of the meal ideas in the Meal Plans come with prep-ahead and packing tips. So why make a dip for lunch? It’s fun, using hummus has lots of healthy fats, protein, and fiber, and it’s filling. 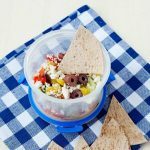 The mediterranean flavors of goat cheese, peppers, cucumber, and Kalamata olives makes this Greek dip super delicious too! I used Sabra’s Roasted Pine Nut Hummus variety for my dip cups, but of course, you can use any of the other varieties as well! The Olive Tapanade one will give it an extra dose of olives (that’s my son’s favorite) and the Roasted Red Pepper is another one that would go well. Fun fact: Did you know that May 21st is National Hummus Day? How much fun would these cups be to celebrate? 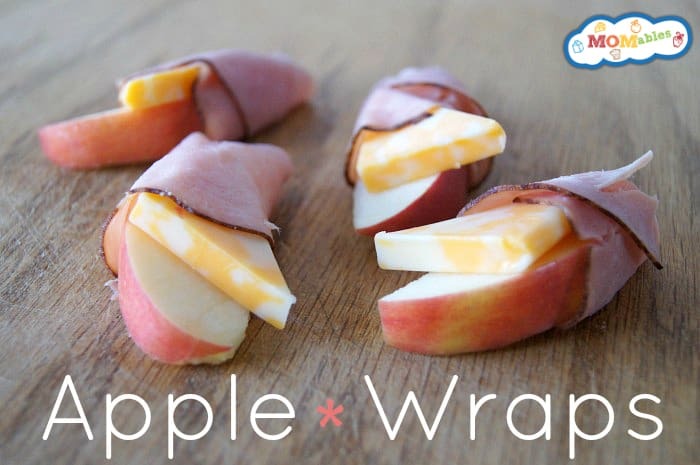 They are delicious for a quick and fun lunch or snack idea. Enjoy! Spread about 2 tablespoons of hummus along the bottom of an 8 ounce lidded container. 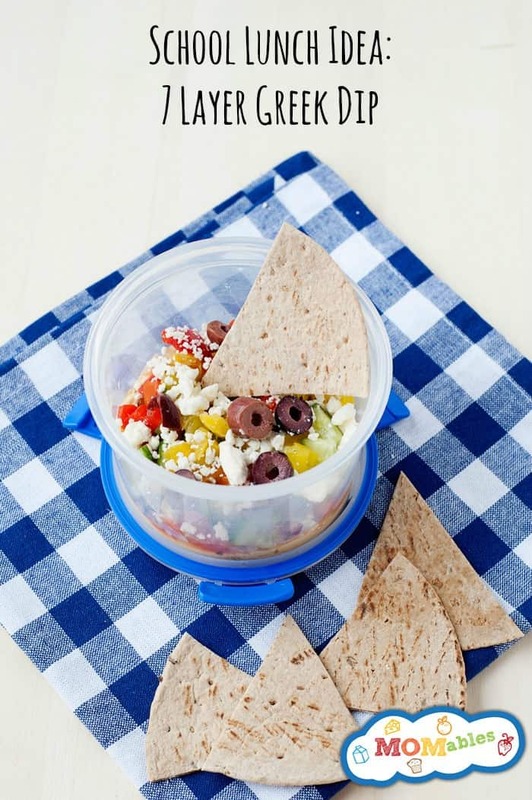 Sprinkle hummus with feta, olives, red peppers, pepperoncini, tomato and cucumber. Garnish with fresh oregano and serve with pita wedges. Refrigerate up to 3 days. 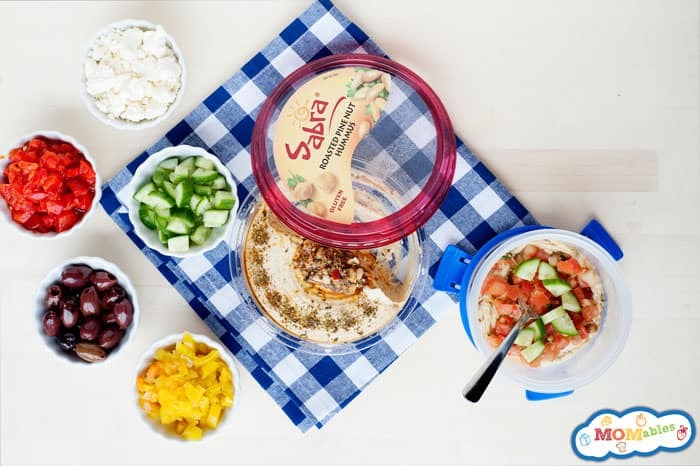 This post was sponsored by our friends at Sabra Dipping Co. From time to time, we partner with brands that support our mission: to add variety to our family’s school lunches and meals. 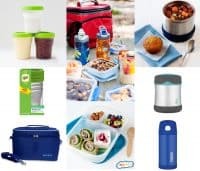 Check out the basic school supplies that will help you pack healthy school lunches!